Premier League title contenders Liverpool raced to the top of the table as an exhibition of attacking football saw them hit Watford side for a staggering six goals at Anfield. 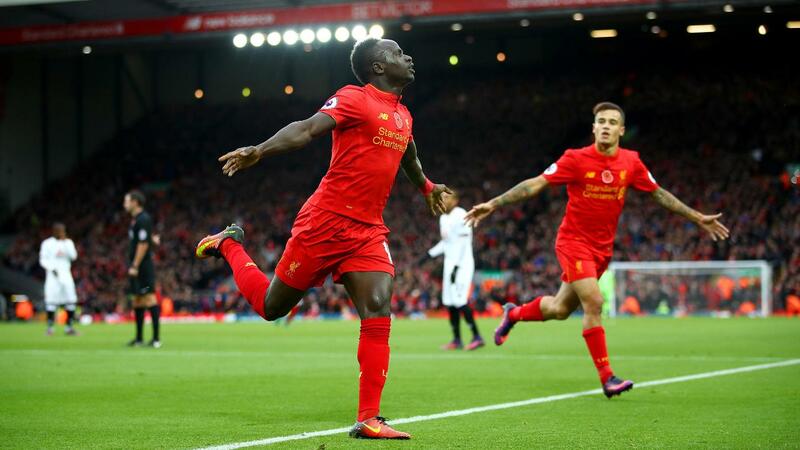 Daryl Janmaat's late consolation failed to deter The Reds, infact spurred them on, as Georginio Wijnaldum completed the rout late on. Roared on by their home supporters, the excitement was through the roof as Liverpool were one victory away from leading the Premier League table. They started fast, too, as Lucas Leiva's chance in the opening stages following a corner was brilliantly saved by Heurelho Gomes occupying the goal for the visitors. Anfield was in awe of Liverpool's exquisite movement and interchanges, especially between star attacks Coutinho, Firmino and Mane. 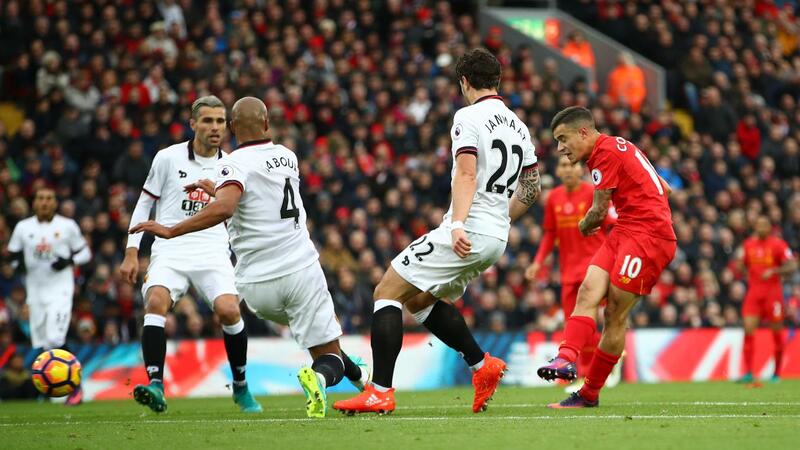 Watford were in for a tough afternoon, as Philippe Coutinho once again illustrated his immense skill, movement and tenacity as he went tantalizingly close on two occasions. Striking the crossbar on his first attempt, the second saw his dazzling ruin in between the defence culminate in a low, sweeping strike that skimmed off the side of the netting ta the near post. He was at the core of each attack. Ironically, having squandered clear-cut chances The Reds would've buried on any other day, Sadio Mane broke the deadlock in tricky circumstances with a sublime header. Milner won a corner with some delightful interchanging with Henderson which forced Gomes into action, however the subsequent corner dealt a killer blow to Watford's hopes as Sadio Mane escaped his marker to meet Philippe Coutinho's cross and rifle a header into the back of the net. Klopp's men cooked up an exhibition of attacking football and, too Watford's clear displeasure, didn't look like slowing down. The hosts were plain sailing heading into the break, as Emre Can capitalised on Amrabat's nonexistent marking to rise high and effortlessly direct a header into the bottom corner. Costel Pantilimon was left wonderinig what kind of mess had dragged himself into. Pinned in their own half - Watford's already dismal day turned into a helpless and depressing one- Roberto Firmino starting the second half as the first finished to make it 4-0. All fault lied with Watford, too. The attacking starlet star Firmino, in acres of space, was on hand to tap home from close range following Adam Lallana's low cross from the left side of the box. Minutes later, as it seemed it would, Watford's defence somehow unravelled even more as Sadio Mane secured a well deserved second of the match. For a moment, Roberto Firmino looked on course to score again himself but instead he took the ball down to the right byline, held up the defender and allowed Mane to scamper into the box - effortlessly sliding a short lay-off across the area where his teammate condemned Watford to a fifth from close range. Sadly little too late for the visiting supporters, Daryl Jaanmat at least sent them on their travels with something to smile about. Nordin Amrabat, who had an absolute stinker beforehand, somehow departed Anfield with an assist intact as he laid off Jaanmat on the edge of the box and the Dutchman took it in his stride - easing the ball past Karius low into the left corner. Testament to Jurgen Klopp's coaching mentality, he demanded an even higher intensity in the closing stages. His team obliged. Daniel Sturridge twice hit the bar, Roberto Firmino's follow-up was brilliantly kept out by Pantilimon, before Georginio Wijnaldum sealed the sixth from close range at the expense of a third missed chance by substitute Sturridge. The Reds trampled all over Watford's soul and catapulted to the top of the league in doing so. Jurgen Klopp's side are legit title contenders and a real force to be reckoned with.